Ok I am doing a little searching for you and I am finding out some things. Good luck with your watermelons. Watermelon is very susceptible to frost damage, it requires a long growing season with relatively high temperatures. Daytime temperatures between 70 and 80 degrees F and nighttime temperatures between 65 and 70 degrees F are ideal. Plant them in a place where it gets full sun, no shade or very little shade. Gardeners in northern areas should choose early varieties and use transplants. Mulching also promotes earliness by warming the soil . 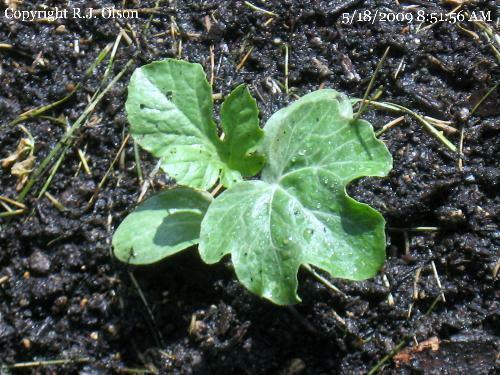 Plant after the soil is warm and when all danger of frost is past. Watermelons grow best on a sandy loam soil, although yields on clay soils can be increased significantly by mulching raised planting rows. Watering is critical in growing watermelons. The key time to water is from the time the fruit begins to form until it is half-grown. Excessive watering too close to harvesting of watermelon will reduce the sugar content and cause the fruit to have hollow centers. My daddy had several rows of watermelons one year, they were delicious. My mother said that her daddy used to grow them each year and sold a lot of them at market time along with other things that they had extra of. My experience is different varieties have different growing periods. I had watermelon last year but can't for the life of me remember what kind I'm thinking sugar babies but I've planted different ones over the years and could be confused. Last year was 2-3 months and the blooms were big white flowers that were beautiful. Hi Grandpa B,Last year was my first time to pant watermelon and we enjoy to eat the fruits after 3 months.....I remember during those time, I water them 1-2 times a day due to very hot weather....I am not an expert but I know you will be able to make it... Wish you can get more tips from other gardeners! ENjoy!